Mood swings are one of the most common symptoms of menopause, but they can be miserable to deal with. You can be happy one moment and screaming the next. This emotional fluctuation is primarily due to the hormonal changes occurring during menopause, which can affect your brain chemistry. Read on to learn the truth about vitamins for mood swings. Prescription medications, whether it be hormone replacement therapy (HRT) for estrogen decline or anti-depressants, are not generally suitable options for women who are experiencing mild to moderate mood swings. Anti-depressants are usually reserved for severe cases, or for people with major depressive disorders. HRT on the other hand, does not directly help improve mood, and if the dosage is incorrect it may even worsen irritability or cause fits of rage. For most cases, the solution is simpler and more natural than many realize. Vitamins for mood swings, whether supplemental or through sensible dietary choices, can have a profound effect on mood as they are crucial for proper body and brain functionality. Women can actually become much more sensitive to vitamin deficiencies during menopause. Even if they were able to get away with it in the past, this might not be the case when menopause strikes. This can be due to various factors, mostly because of the toll that is already taken on the body due to other symptoms like night sweats, hot flashes, and anxiety. In addition, aging is usually accompanied by a progressive decay in digestive function, which can lead to absorption. B12 is one of the most important vitamins for brain function, and a lack of it can result in paranoia, confusion, and irritability. However, it is not the only vitamin to check: B6, B9 (folic acid), B3 (niacin), and B1 (thiamine), are also of central importance for mood stability. 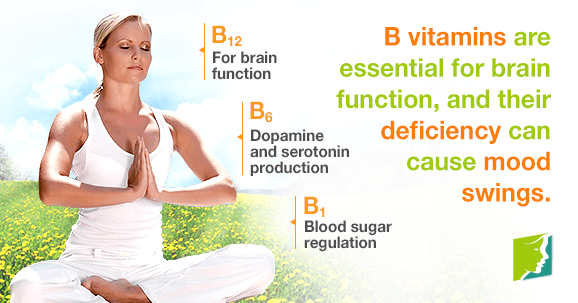 Without B1, the brain cannot convert blood sugar to energy, quickly causing fatigue and depression. Also, vitamin B6 is extremely important for the production of “happy brain chemicals”, such as dopamine and serotonin. Vitamin D and Calcium are most definitely essential for maintaining strong bones. Vitamin D deficiency is also linked to mood swings, major depressive disorder, and season affective disorder. Frequent mood swings are often linked to this common vitamin deficiency. Meanwhile, calcium depletion can directly affect the central nervous system and cause tension, restlessness, and irritability. Understand the myths and facts for mood swings before jumping to any conclusions. It is important to know the function of vitamins for mood swings, so that you can choose your foods and supplements carefully.